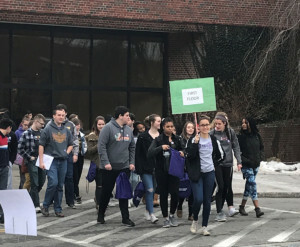 On Wednesday, March 13, 2019, more than six hundred high school students from the Rochester area gathered at the Nazareth College Hickey Center for Interfaith Studies & Dialogue for the 9th Annual Global Citizenship conference. This conference is designed to create a safe space for high school students to learn about and discuss diverse religious and cultural traditions through a series of presentations and discussion sessions. Among the 600 were forty Wheatland-Chili students but, unlike the rest, they were there for a different kind of experience. Schneider is also on the board for the conference. The first years, Nazareth students volunteered. However, Schneider asked if his students could fill that role instead. He sees this volunteer experience as a glimpse into college life.